Part of the proceeds from our last Film Festival -SHIFF’12- has been earmarked to help provide medical equipment to a small community in Ecuador. The project is being overseen by the LATA Foundation and concerns the village of La Bocana de Ostiones in the province of Esmeraldas where the inhabitants live in conditions of extreme poverty. The overall project concerns the building and staffing of a small medical centre and the Rotary Club of Sherborne Castles will be providing much of the required medical equipment. The building itself is ready, constructed by a local NGO Fundacion Ecuador Tierra Viva. 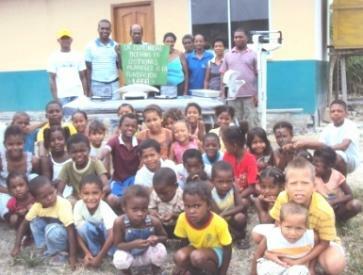 Engineers without Borders are installing a water and sanitary system in La Bocana and the provincial health authorities from Esmeraldas have agreed to provide staff. Our donation has now helped LATA reach their overall target of $2000 (£1250) to provide the equipment needed including an adjustable bed, precision scales, diagnostic equipment with phonoscope and laryngoscope and suture kit including surgical knives, scissors and needles. How we are helping: Trolley $123.65; sterilising equipment $770.00; blood pressure equipment $98; stainless steel tray $20.67; steel emesis bowl, specialist medical lamp and ancilliary equipment $164.06. Other donors include the Latin America Society from University of Leicester who have raised money for blood pressure equipment. Next Entry We are all choc’d out!